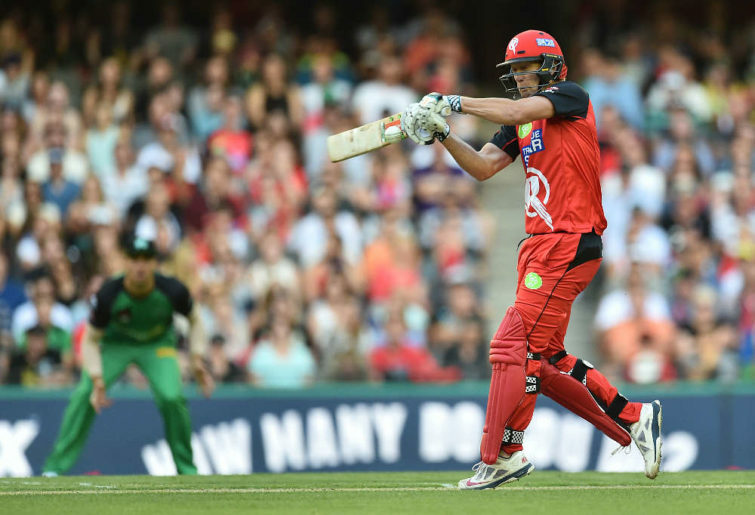 The Melbourne Renegades are a team who have always had plenty of potential without the results to match, but BBL|08 is promising for a club who made the semi-finals last year. While winning six of their ten regular season games last time around allowed them to finish third, their semi-final loss ended the season below expectations. This time around, the Renegades will be aiming to avoid a season which ebbs and flows as much as last season. They won four of their first five, then lost three on the trot, before winning their final two to squeeze into the top four. The side has plenty of experienced players running around and have mixed up their import strategy this season, although Mohammad Nabi will return to play a vital role with both bat and ball. The pressure is on the Renegades to do something special, and their squad has the potential to get the job done. Led by Aaron Finch, this batting order’s strength will depend on who is playing for Australia and who isn’t. Cameron White and Tom Cooper were both excellent last season and must be again this season, but it was Marcus Harris who, having scored 324 runs for the Renegades in 2017-18, will have a big role to play, provided he doesn’t miss too much time with Australia. Tim Ludeman is likely to play a prominent role at the top of the order as wicketkeeper, but with a likely fleet of all-rounders to follow, it’s on whoever is in the top four to score big runs consistently. As mentioned, the Renegades have a stack of all-rounders, of which Afghan international Nabi is the most prominent. His T20 bowling average of 21.65 and an economy of under seven, and powerful hitting, makes him one of the best short-form players in the world. From there, it’s a dispute for the remaining spots in the order. Dan Christian, who comes to the club from Hobart, will add to the pace bowling stocks, while players like Beau Webster and Jack Wildermuth will vie for positions should they become available through international selection or injury. It’s the bowling attack which holds the most potential, but also the biggest questions for Melbourne. Spinners Jon Holland and Cameron Boyce will likely fight it out for one spot, given the strength of the pace bowling attack. Pakistani quick Usman Khan Shinwari is the side’s second import, although he’ll be replaced by English fast man Harry Gurney later in the season, while Kane Richardson and Chris Tremain also feature in the squad. Joe Mennie and Will Sutherland are likely to be limited to back-up positions for the franchise, who have plenty of options to play with in what is a strong attack. The Renegades could be severely impacted by both Test and ODI cricket this season, with both Marcus Harris and Chris Tremain getting close to earning their first baggy greens. While that duo are a chance to play in the Test arena, Melbourne skipper Aaron Finch is unlikely to play much at all for the side, given he is currently playing all three formats for the national team. While there are no other expected absentees, Usman Khan Shinwari will leave at the midway point of the season. Harry Gurney is a like-for-like replacement, but it could throw things off in the middle of their campaign. Do they have enough quality spin bowlers? Spin bowling is being used more and more by T20 teams. The Renegades will be relying on Jon Holland and maybe Cameron Boyce to do the work in 2018-19. Whether Boyce even gets a spot in the starting side is questionable, as Holland will almost certainly be the number one tweaker for the franchise – his form will quickly come into question if it’s not up to scratch. On stats alone, Boyce is actually the preferable option having an average of 24.84 with the ball in the shortest format of the game, compared to 37.81 for Holland. 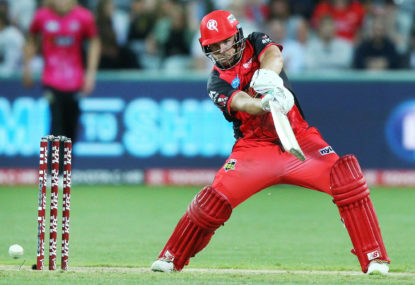 Regardless, both go for around the eight runs per over mark across their careers and will be required to carry a lot of the load for the Renegades, particularly at home during the powerplay. Where the questions will begin is when the Renegades begin turning to their part-timers, as they did time and time again last season. Tom Cooper found himself with the new ball at times, while Mohammad Nabi will also be expected to play a prominent bowling role. While they do have plenty of part-time spinners, neither of their top-tier options have set the world on fire in previous editions of the BBL, and given the importance of slow bowling in T20, they will need one of Holland and Boyce to stand up and make the position their own. How will Aaron Finch be replaced at the top of the order? 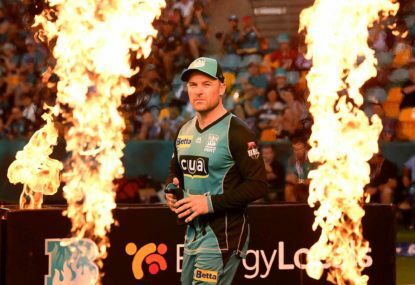 Aaron Finch hasn’t been the most consistent performer in the Big Bash recently, but he has brought an explosive ability to get innings off to a good start. The bottom line is that, as an explosive opener, Finch still goes past 50 nearly once in every four innings across his career, which is an impressive record to go with a strike rate of 143.44 in the shortest format of the game. But his recent call-up to the Test team will leave the Renegades needing a new opening combination for most of the season. Whether he only had three or four big games in the BBL or not, his loss at the top of the order is a big one, especially when you consider the replacement options. Both Cameron White and keeper Tim Ludeman are capable of filling in at the top of the order. Given Ludeman opened frequently back when he played for the Adelaide Strikers, he looms as the man most likely to take Finch’s spot. But while Ludeman has some impressive opening innings on his CV, he doesn’t hold a candle to Finch at the top of the order, and it’s probably the one area of recruitment where the Renegades have fallen down. Instead of going for Shinwari with an import spot, they could just have easily have gone and found a top-order batsman. When you look down the Renegades list, it’s White and Cooper who will be under the most pressure. That doesn’t come from a lack of results in this circumstance, but instead from being the two men most expected to perform on a consistent basis. Both had good returns last year, with White scoring 304 runs at 76 and a strike rate of 111, while Cooper had 298 runs at 49 and a strike rate of 141, but they may need to go up another gear to keep the Renegades competitive this year. Essentially, they are the two names who are guaranteed to be in the top seven all season long as part of the Renegades best XI, and if their form drops away, it’s hard to see the franchise scoring enough runs to be competitive. 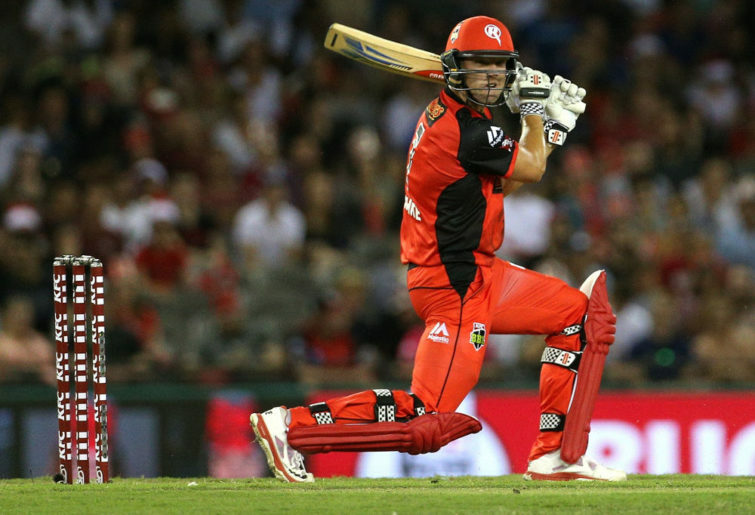 Heading into BBL|08, the Renegades boast some formidable pace bowling stocks. The side’s best XI is probably going to feature Tremain, Richardson and Shinwari (provided they play three quicks) alongside the all-round talents of Christian or Wildermuth, but their back-up brigade is not to be forgotten about either. Harry Gurney will come into the side when Shinwari leaves, while it looks like there could be no room in the XI for former Australian international Joe Mennie and impressive youngster Will Sutherland. Sutherland’s performances in the one-day cup at the start of the season indicate he could have a BBL spot in some other teams, yet he is probably not even the first back-up option in Melbourne. Shinwari comes to the franchise without a great deal of experience, but with plenty of talent. He has burst onto the scene with 57 wickets in 47 matches on the T20 circuit, averaging 20.24 with a strike rate of 16.6 and an economy rate of 7.2. They are all impressive numbers and he will be the go-to man for the Renegades. Tremain and Richardson have well-known skills, as does Mennie, who would be disappointed to miss out with an average of 19 in T20 cricket with the ball. However, quick bowling is a skill being used less and less in the format, especially on slower grounds like Marvel Stadium, so it’ll be interesting to see exactly how the Renegades go about utilising their all-star pace attack. 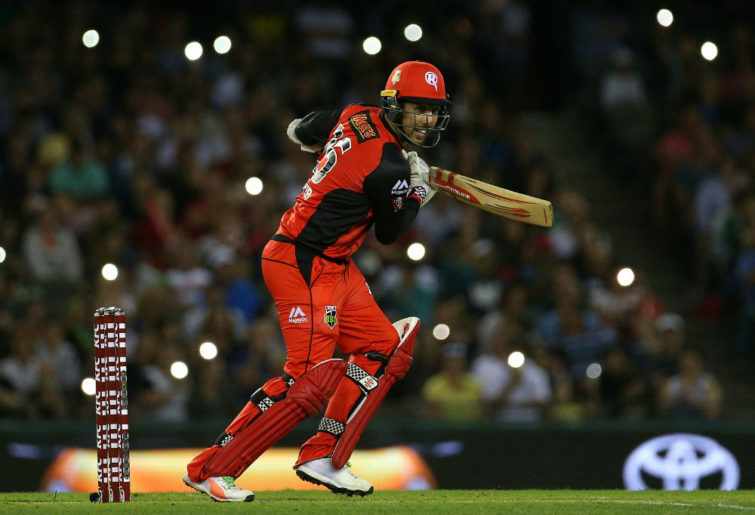 A top-two finish could benefit the Renegades greatly. With the expanded season, they will have seven regular-season games at Marvel Stadium, and with it being one of the slower pitches in the competition, it’s going to be tough for a team to come in there and win a final. 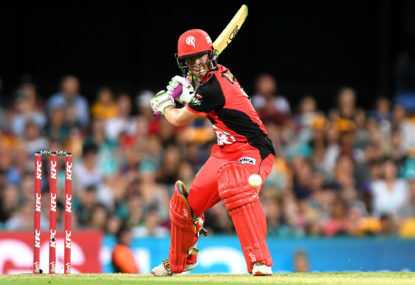 Knockout matches bring with them more pressure than any others and it’s little surprise the home side wins more often than not – as the Renegades know all too well from last year. Docklands brings with it more of an advantage than many other grounds given the almost unique conditions, and a top-two finish with a home semi-final could be the advantage the Renegades need to change their fortunes from last year. The Renegades are a side who should be in for a strong 2018-19 season. Anything less than making the finals would be a disappointment. While it’s unclear whether they have the matchwinners to take things all the way once the finals start, they should be good enough to book themselves a home semi-final. 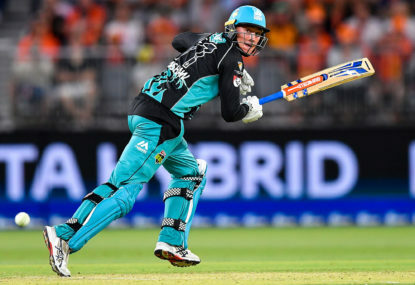 Be sure to join The Roar throughout the course of the Big Bash League season for live coverage of every game, including video highlights and all the best analysis and opinion of the competition. Melbourne Renegades memberships are on sale now at GETONRED.COM.AU. 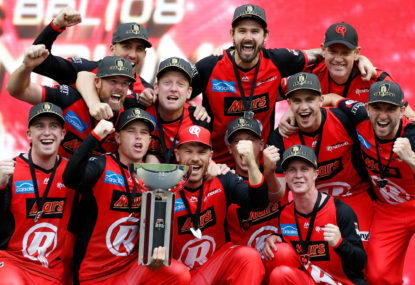 Jubilant Melbourne Renegades skipper Aaron Finch admits he had almost given up all hope shortly before the Melbourne Stars’ stunning collapse delivered his side a maiden BBL title. 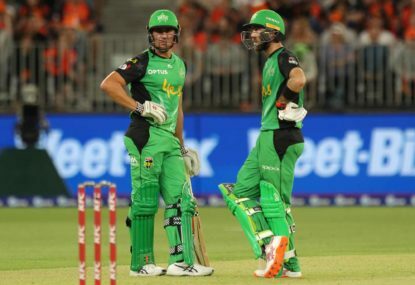 When the old state Twenty20 Big Bash was revamped eight seasons ago to become the eight-team, six-city Big Bash League, there’s no doubt in my mind that among the goals for the new competition was for a final to be played by cross-town rivals.